If your measurement is 48mm then you proceed to the section titled Zeiss® OPMI® MicroFigure Twoscopes. 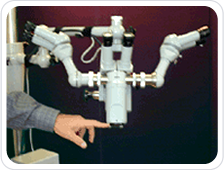 If the measurement is 65mm you proceed to the section titled Zeiss ® MD/CS/11 Microscopes. 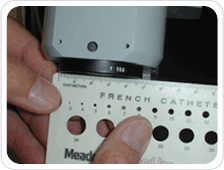 If the measurement is 68mm you proceed to the section titled Leica ® Microscopes. Then pick the drape with the width and length that the O. R. feels will adequately cover the microscope. The other sure method is to get the product number that they are currently using and use the cross-reference guide to find the equivalent MTI drape. The last method is to call MTI at 1-800-426-9053 and ask for help, we will be very happy to assist in the cross-reference.